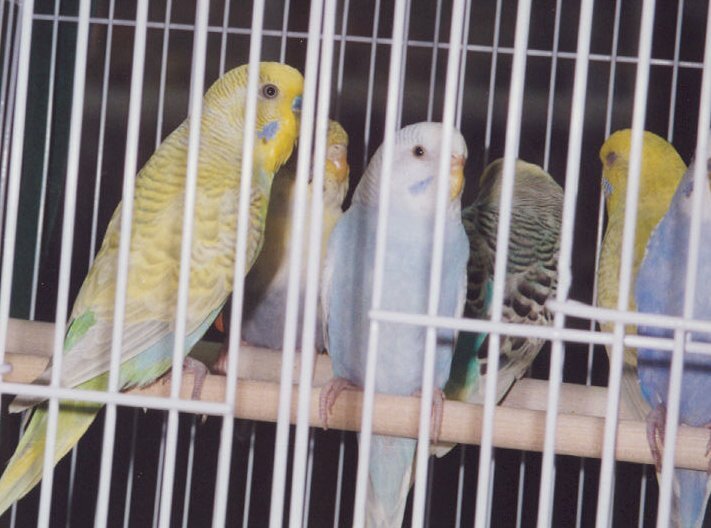 Budgies are a highly gregarious species, and breed best when you have three or more pairs within sight and sound of one another. I personally recommend colony breeding these guys. They are usually not aggressive and will coexist peacefully with similar species, particularly other Aussie keets. Some people even keep them with zebra and society finches. 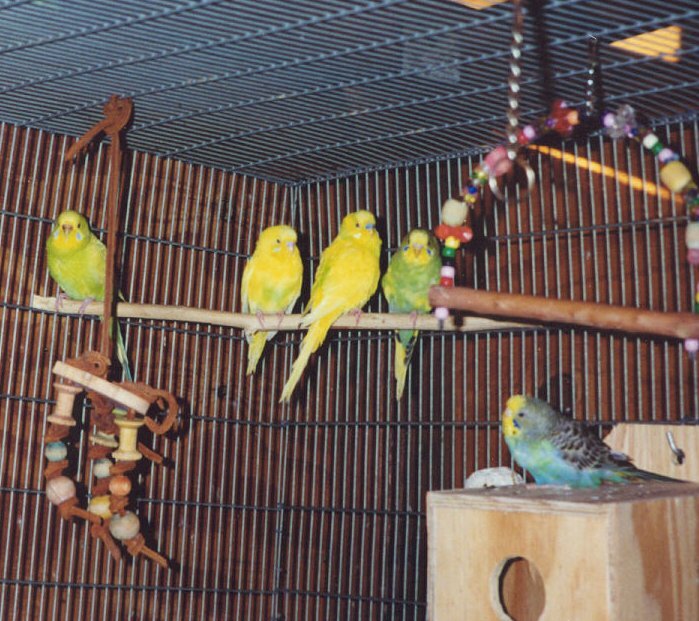 Not only will colony breeding increase your chances for success with budgies, but it will allow you to observe them as a flock, a key to learning about bird behavior. You want all birds to be paired up. However, if you must have spare birds they should be males. Unpaired males are usually not a problem. Males bicker over mates but I’ve never seen them wound one another. Spare hens, on the other hand, can be a serious problem, especially in a smaller setup. Hens are much more aggressive when defending perceived breeding territory and are not above killing each other’s chicks. Unpaired hens will fight over available males, while unpaired males may feed or mate with paired hens with few problems. The cage should be large. 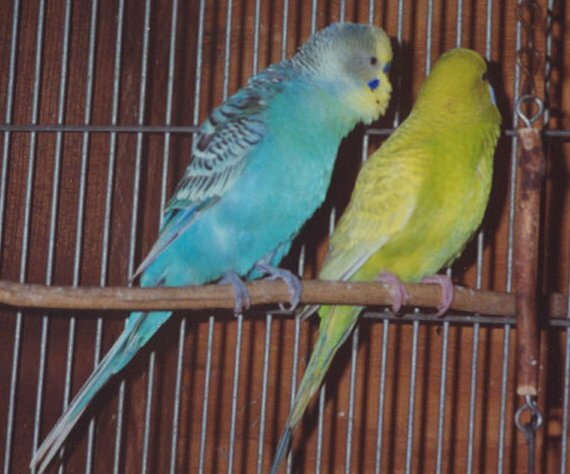 Budgies are very active birds and you’ll need space not only for the parents but for about five chicks as well. Overcrowding causes stress and increases the chances of disease. Flights are better than cages as they give birds more room to get about (and get away from one another). Supply plenty of perches, swings and toys. As with any species, offer more nestboxes than you have pairs and keep them all at the same height. 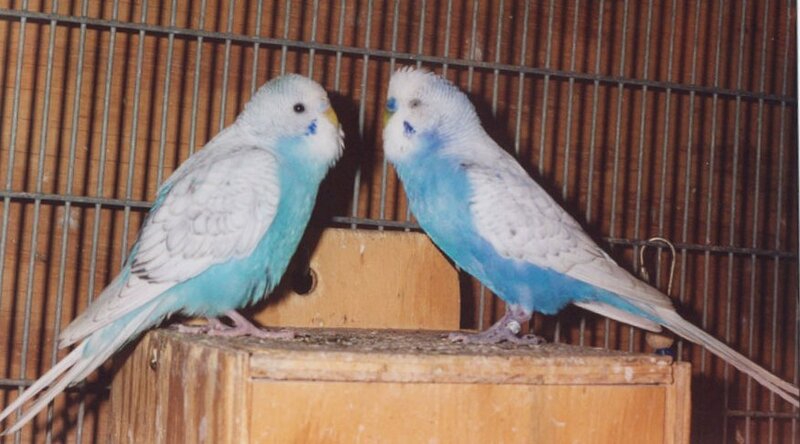 Budgie hens will fight over nestboxes and injure one another if there are not enough. Also try to space them out a bit to avoid territorial conflicts. I once had a flightless hen who staked out all four of the aviary’s nestboxes, laying one or two eggs in each. She hopped from box to box, never incubating, concerned solely with driving away the other hens. I solved the problem by moving the boxes further apart so that she couldn’t hop down the line quickly enough to make the defense effective. Once everyone has their own box you can remove most of the extras; leave a few spares in case a pair wants to change boxes after the first clutch. 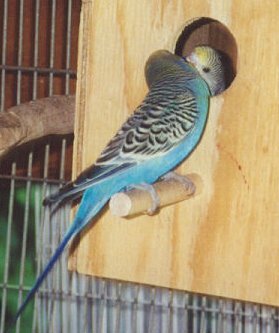 Budgies are curious and will often check out nestboxes immediately after they are placed in the cage. In single pairs and smaller colonies males usually examine the boxes first, then try to entice their hen to come inside. In larger flocks I’ve seen more pairs checking out boxes together. Once the box is chosen the hen will spend more time in it. If you’ve placed shavings in the box she’ll most likely kick them out. This is normal. In the wild, budgies nest in tree cavities. Cavities are limited and have most likely been used by other birds. They will contain old feces and feathers, perhaps diseased. Budgies will therefore kick out any perceived leftovers from the last residents. New shavings can be placed in the box once the chicks have hatched. Many hens stop kicking them out when they have chicks, though a few die-hards will continue. A lot of people ask me how soon to expect eggs after mating. It is important to understand that breeding behavior does not always lead to eggs and chicks. Just because you see them mating, there is no guarantee you’ll get eggs. Breeding behavior is fairly specific. The male approaches the female, usually chattering incessantly, pinpointing his eyes with excitement and then rapidly tapping her beak. The tapping is also interspersed with him moving his beak up and down parallel to hers. Females illicit mating by raising their tail and lowering their head. The male will then balance himself on top of her, curving his wings around her sides while rapidly rubbing his cloaca against hers. Mating does not last long and is repeated frequently. Some hens are coy and will peck the male away if they see you nearby. Mating typically takes place on a perch but I’ve also seen pairs mate inside the nestbox. Male (right) hitting on immature hen (left). Adult male (left) hitting on adult hen (right). It was once believed that birds were the epitome of monogamous partners. 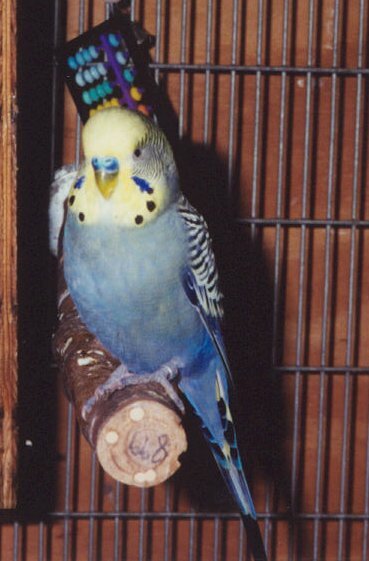 Whoever came up with that never owned budgies. 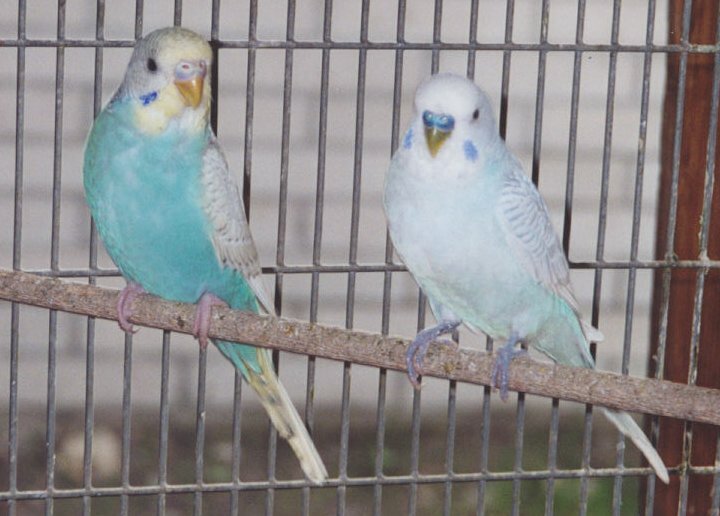 Budgies, both males and females, are probably as frivolous as you can get. This is one of the few downsides to colony breeding- you can’t track genealogy with any certainty. If you are breeding for specific mutations, colony breeding would not be the best choice. English breeders rely heavily on specific bloodlines and may prefer studding, a method in which females are kept in alone in cages and one male is used to fertilize each. This puts more strain on the hens though, who have to raise entire clutches alone. Try to keep your birds paired evenly if possible. Females lay anywhere from two to nine eggs which are then incubated 18 days. Chicks hatch naked and blind and can be fed while lying on their backs. The female feeds the chicks for the first few weeks while the male feeds her. Once the chicks are old enough to require less brooding the hen will spend more time away from the box and both parents will feed the chicks. Eventually the male takes over almost completely and will finish the weaning while the hen starts a new clutch. Chicks start eating on their own almost immediately after fledgling. Do not sell them at this time though. Once a chick has been eating completely on its own for at least a week, without begging from the parents, it can be considered weaned.